New cell phone apps have just been developed that not only claim to predict the likelihood of a fall, but can also help prevent the chances of future falls. More than 47 million Americans are age 65 or older, according to the Department of Health and Human Services. U.S. Center for Disease Control data finds a third of that group will suffer a fall each year. Falls in this population can lead to serious injury, a loss of independence and even death. Hospitals have searched for ways to prevent falls, particularly after 2008 when Medicare began refusing to pay for the cost of treating a fall with injury that might occur in the hospital when a patient, for example, tries to stand up and falls off a bed. The Centers for Medicare and Medicaid Services deem such falls preventable, and state they therefore “should not occur after admission to the hospital.” Even so, million such falls occur in hospitals each year, according to the Agency for Healthcare Research and Quality. Previous fall prevention strategies have centered on the use of a patient sitter. Patient sitters are people employed, often in a hospital setting, to sit in a room and observe a patient at high risk of a fall. A recent study that analyzed data from 75 hospitals participating in the Hospital and Health System Association of Pennsylvania Hospital Engagement Network Falls Reduction and Prevention Collaboration found a correlation between low rates of falls with harm and the use of sitter programs. However, three components made a vital difference in the success of a specific sitter program: defining criteria for sitter qualifications, using a consistent training program for sitters and having a pool of sitters available. Hospital administrators were reluctant to hire a patient sitter for each at-risk client. Administrators found it difficult to justify the expense, especially when a training program had to be implemented to achieve results. A few years ago, video monitoring improved the cost effectiveness of watching each patient in a hospital setting. Monitors allowed a single trained employee to watch several rooms at a time. TIRR Memorial Hermann rehabilitation hospital in Houston, Texas introduced the AvaSys TeleSitter http://avasure.com/ video monitoring system in 2014. (Monitoring equipment is also available from Cisco and Nexus. The monitors are portable, wireless units with two-way audio, and they have reduced falls 8.6 percent. Ten patients can be monitored by a single, trained employee. However, TIRR still uses patient sitters for new patients until they are “stepped down” to the telesitter. A side benefit of the system is the 54 percent reduction in injuries to staff since the introduction of remote monitoring. Technology for fall prevention has recently taken a giant step forward with phone apps that can be used at home or anywhere. We’ll take a look at two, Agewell’s Equilibrium and Kinesis QTUG. Developed by a physical therapist, Equilibrium uses a smartphone or wearable device to detect older adults likely to have a fall, and then determines the best treatment to reduce the risk. With minimal training, a family member or caregiver can make the assessment using either a smartphone for periodic testing, or a wearable sensor for continuous monitoring of physical function. The device can also be used by physical or occupational therapists, care workers, doctors and nurses. Currently, the Equilibrium prototype operates on an Android platform and has been tested in assisted living, outpatient physical therapy, home health and community settings. A pilot program can be accessed on the Equilibrium website. “Falls are the leading cause of injury-related death in older adults and can lead to social isolation, depression, lack of independence, hip fracture and sadly, even death,” according to the Equilibrium website. “Many who fear falling limit their activity and engagement in enjoyable activities leading to loss of strength. Ironically, these are the two main reasons people have falls.” But how can you tell if you are at risk? Using the app sounds easy. All you have to do is the hold the app to your body (or to whomever you want to assess) or put it in your pocket. Then, you perform a series of movements such as walking across a room or sitting in and getting out of a chair. The movements take about a minute to complete. The Equilibrium system analyzes your results and sends them to your phone. Equilibrium lets anyone monitor, measure and score falling risk, and it alerts you to a change in physical status. The app uses predictive analytics to tell you if you might need changes to your medical regime (Is your medication causing you to feel woozy? ), diet (Did that huge sugary snack affect your balance? ), exercises (Are your quadriceps muscles getting weak? ), or environment (Is it time to take the rugs off the floor?). After determining the likely best course of preventive action, Equilibrium can document objective outcome measures that comply with Medicare. Equilibrium can integrate with electronic health records to provide objective measurement and outcome reporting. Kinesis QTUG (Quantitative Timed Up and Go) is another cell phone app, but it works using a pair of sensors tucked into elastic and wrapped around the subject’s calves. In less than five minutes, QTUG claims to measure not only the risk of falling, but also frailty. According to Kinesis, the scores are validated with nine years of extensive research. Get the New Year off to a good start with these quick and easy exercises you can do at home! All you need is a kitchen chair and five minutes to be on your way to better strength and balance. The older adult stands, walks and turns, and the QTUG program compares the person’s gait and mobility to average values for the same age and gender. Results are color-coded for easy visibility. QTUG will analyze how an older adult responds to intervention, therapy or medication when scores are reassessed at regular intervals. It’s possible to trend risk of falls, frailty measurements and test data over time. The app uses responses to a fall history questionnaire based on the American Geriatric Society/British Geriatric Society (AGS/BGS) guidelines for fall prevention as well as information that it gathers from sensor data to create an accurate and objective fall-risk profile. The company touts its user-friendly design and intuitive display. The program is Health Insurance Portability and Accountability Act, or HIPAA, compliant, with back-up to the cloud, and patient results can be exported in Excel format. Competitors with Equilibrium and QTUG include Intel-GE Quietcare and Healthsense. Both require installing hardware at the older adult’s home and using motion sensors to assess risk and falls. Phillips Lifeline fall alert pendant sends an alarm only after a fall is detected. Jitterbug’s GreatCall services-apps offers a line of cell phones that include fall detection and also a support line for health issues. “Patient sitters found effective in reducing falls,” AHC Media LLC. “Equilibrium: Preventing Falls in the Elderly,” MedStartr, inc.
“Video monitoring reduces falls as well as cutting costs for hospitals,” AHC Media LLC. 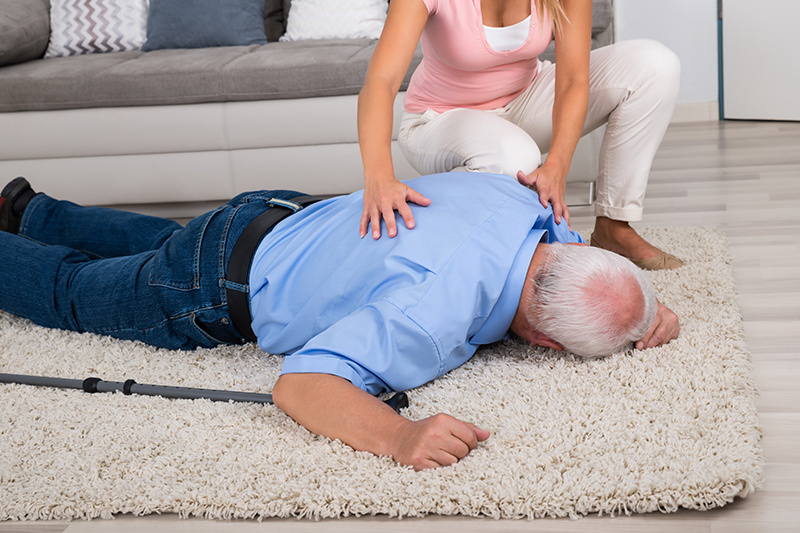 “Patient sitters effective in reducing falls,” AHC Media LLC. “Six Elements Key to Patient Sitter Program,” AHC Media LLC. “Medicare Nonpayment, Hospital Falls, and Unintended Consequences,” New England Journal of Medicine (NEJM).